Spoa is a small village located roughly halfway between Pigadia and Olympos. 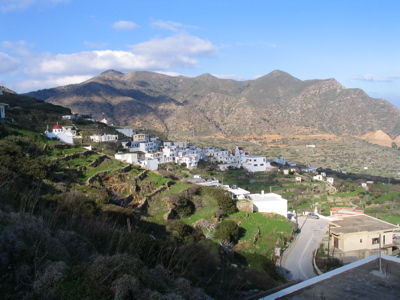 It is high enough above the sea, so there are nice views of the eastern side of the island from this village. It is also a good place to stop and have a rest if you're making the somewhat brave trip by road to Olympos. There are a couple of good coffeehouses here where the locals gather, but there isn't much else to do in this village other than spend an hour or so walking around the village, taking in the scenery, and catching a glimpse of life in a typical Karpathian village.